Today, one of my all-time favourites. I’m not at all knowledgeable about art, but I do know that I’m more drawn to the classical style. And Bouguereau’s art ticks all the boxes for me. This was the first piece of his that I saw and I fell in love straightaway. 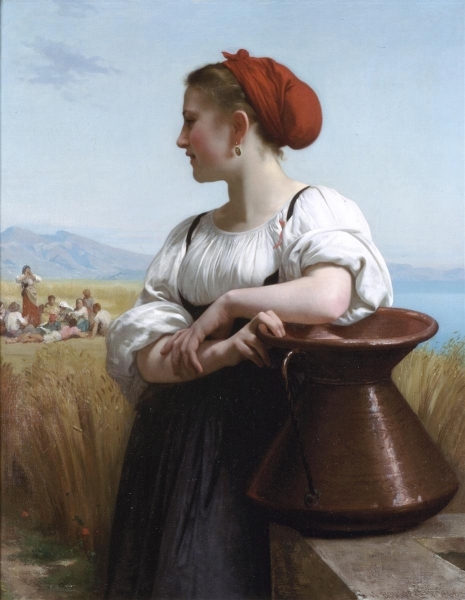 William-Adolphe Bouguereau was born on 30th November 1825 in La Rochelle, France. He wasn’t born into a family of artists but one of wine and olive oil merchants. 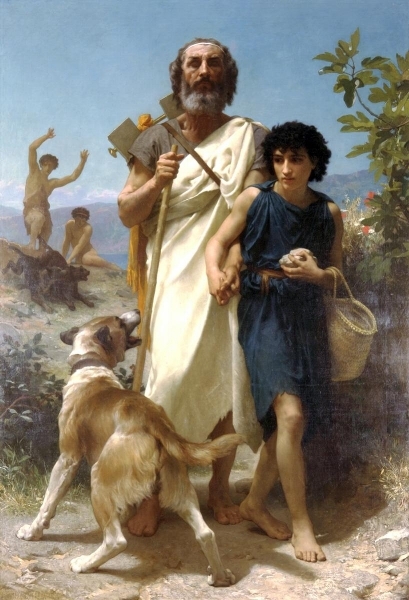 The only reason Bouguereau didn’t end up following family tradition was down to his uncle Eugene who was a curate. He not only taught the young boy classical and biblical subjects but also arranged for him to go to high school. Again, thanks to his uncle, Bouguereau gained a commission to paint portraits of his uncle’s parishioners. It wasn’t just his uncle who helped him; his aunt matched the sums he’d earned from his paintings, enabling Bouguereau to head off to Paris. There, he enrolled at the Ecole de Beaux-Arts. Bouguereau took his art seriously. To augment his formal training in drawing, he also attended anatomical dissections and studied historical costumes and archaeology. Fate continued to favour the young man when he was admitted to the studio of Francois-Edouard Picot to study painting in the academic style, which placed great importance on historical and mythological subjects. In 1850, Bouguereau finally won the coveted Prix de Rome with his third attempt, his painting of ‘Zenobia Found by Shepherds on the Banks of the Araxes’. The prize included a three-year residence at the Villa Medici in Rome, where he had formal lessons and was able to study the life and work of Renaissance artists along with the other category winners. This must have been immensely pleasing for the young painter, to be favourably compared to his favourite, Raphael. 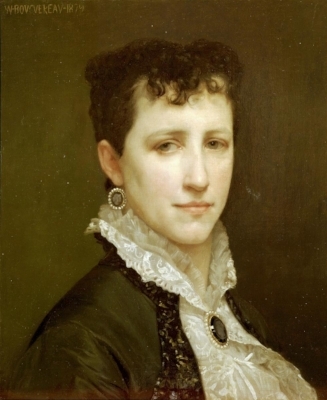 In 1856, Bouguereau began living with one of his models, 19-year-old Nelly Monchablon. Although they were living out of wedlock, many assumed they were wed. Together, they had five children. The first, Henriette, was born in 1857, followed by Georges two years later. Their third, Jeanne, was born in 1861. The couple only got married in 1866, which they did quietly. Sadly, eight days later, Jeanne died from tuberculosis. Their fourth child was born in 1868; although named Adolphe, he was known as Paul. When the health of 15-year-old Georges started to suffer, Nelly took him out of Paris. Unfortunately, he died in 1875. In 1876, their fifth child, Maurice, was born. By now, Nelly’s health was suffering, and the doctors suspected she, too, had contracted tuberculosis. Nelly died in April 1877; two months later, baby Maurice also died. Before these tragedies, back when he and Nelly began their life together, Bouguereau had started making connections with art dealers, in particular Paul Durand-Ruel who helped clients buy paintings from artists who exhibited at the Salons. Attracting over 300,000 people each year, the Salons provided great exposure for the exhibited artists. And, throughout his working life, Bouguereau exhibited regularly at the Paris Salon. A committed traditionalist, Bouguereau’s paintings were modern interpretations of Classical subjects. He was known for his almost photo-realistic style; that, coupled with his use of traditional methods of working up a painting, appealed to the rich art patrons of the day. 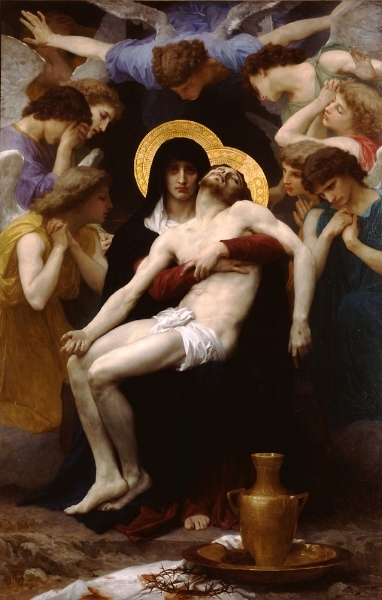 Bouguereau also received commissions to decorate private houses, public buildings and churches. But there was a downside to such commissions – he could not always paint in his own style; there were times he had to conform to an existing group style. He also made reductions of his public paintings for sale, which added to his burgeoning income. And he was also a successful portrait painter. Using his influence to open many French art institutions to women for the first time, he also started teaching drawing at the Academie Julian, a co-ed art institution. Bouguereau’s star continued to rise as he gained the honours of the Academy, culminating with being made a Life Member in 1876. After Nelly’s death, and following a long engagement, Bouguereau married again in 1896. He’d known his second wife, Elizabeth Jane Gardner, for ten years and she had been a pupil and was now a fellow artist. Sadly, tragedy continued to dog Bouguereau’s family; his son, Paul, died in 1900, also of tuberculosis. Of his five children, he’d outlived four, and only the oldest, Henriette, was still alive. His advancing years didn’t curb Bouguereau’s output. He would still rise at dawn and work for six days of the week, continuing to paint until nightfall. In his lifetime, Bouguereau is known to have painted at least 822 paintings; sadly, many have still not been found. William-Adolphe Bouguereau died on 19th August 1905 at La Rochelle. He was heavily mourned in the town of his birth, and a mass was held at the cathedral. His body was then taken by train to Paris for a second ceremony. Bouguereau was buried with Nelly and his children at the family vault at Montparnasse Cemetery in Paris. Bouguereau gained fame in England, Belgium, Holland, Spain and America. Although regarded as one of the greatest painters in the world, he was simultaneously despised by the modernists. 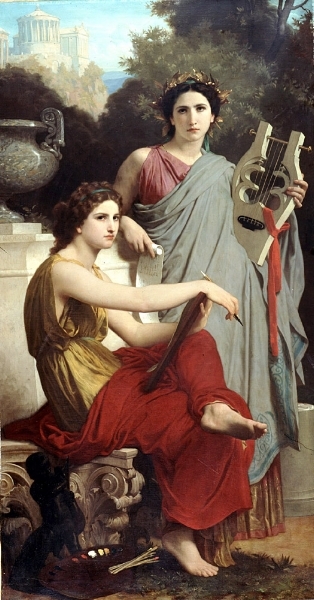 Again, like other more traditional artists of the time, Bouguereau’s reputation suffered due to changing tastes and his own vehement opposition to the Impressionists, who were gaining popularity. Things got so bad that in the following decades, there was absolutely no mention of Bouguereau in encyclopaedias. In 1974, more as a curiosity than anything else, the New York Cultural Centre staged a show of Bouguereau’s work. It would be another ten years before his paintings would be exhibited again, in a major exhibition, which opened at the Musee du Petit-Palais in Paris. The exhibition then travelled to the Wadsworth Antheneum in Connecticut before concluding at the Montreal Museum of Fine Arts. So began a long-overdue renewal of interest in Bouguereau and his works. The sorrow, especially around her eyes, gets me every time. The amount of detail on her gown is stunning! And that is the end of my posts on art… until I discover other artists.